Luxury watch brand Ateliers deMonaco has cleverly blended the high-tech innovation with watchmaking tradition. The result is the spectacular Tourbillon Oculus 1297 in Titanium watch. This luxury watch was just announced at the Baselworld 2016 show in Geneva, Switzerland. This new watch version is based on their masterpiece of precision watchmaking – the Tourbillon Oculus. With stunning color and technical excellence, the Tourbillon Oculus 1297 in Titanium is simply incredible. Let’s start with the watch’s 1297 designation. This number represents the year when the Francois Grimaldi overtook the fortress of Monaco away from a rival Italian faction. Francois Grimaldi disguised himself as a monk and it allowed him to lead a small army into the Monaco fortress and seize it. This achievement created the legacy of the Grimaldi Family and has been etched in time. You’ll notice in the coat of arms of Monaco, there are two monks holding swords. There’s also the lozenge pattern located in the center. This image has become the symbol of Ateliers deMonaco. The Tourbillon Oculus 1297 watch case is made from titanium and is 44mm in size. The watch features a gorgeous, royal blue dial that’s embellished with relief lozenges. With a modern look, it has an off-centered dial at the 12 o’clock position. In addition, the dial aperture and tourbillon are located at 6 o’clock. The high-innovation level and precision of this luxury timepiece are pure perfection. The watch is manufactured and assembled in Geneva. The watch is powered by the Ateliers deMonaco’s own patented Tourbillon XP1 movement. The movement drives the hours, minutes and seconds. The Tourbillon XP1 movement delivers amazing, technical performance along with the sapphire tourbillon bridge. There is silicium escape wheel and lever, plus rotor is made from hand engraved 22 carat gold. 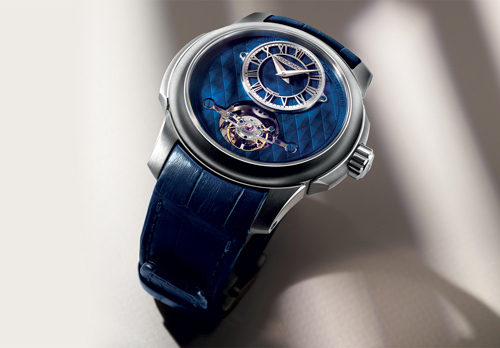 To allow the complicated movement to be seen, Ateliers deMonaco utilizes a sapphire case back. To give the watch dial its brilliance, a 5-axis laser machine was used. This advanced technology method first heats up then melts the material. The result is an incredible finish and an elegant look. The minutes and hours counter can be seen in the upper portion of the Tourbillon Oculus 1297 watch. With a classical touch, it features dauphine shaped hands and indexes done with Roman numerals. This attention to detail has brought together a modern, yet classical look. The Tourbillon Oculus 1297 luxury watch is available in limited edition of only 88 pieces. This timepiece is ideal for a special gift or purchased for one’s own use. It features a matching, royal blue alligator leather strap. The titanium-folding buckle adds touch of luster to the luxurious timepiece. You can also choose a different dial color. There is a grey dial version that can be fitted inside a rose gold or white gold case. If you are a watch collector or connoisseur of fine timepieces, you’ll appreciate the Tourbillon Oculus 1297 watch from Ateliers deMonaco. The Life of Luxury can assist you in your watch buying process. Contact us for further details. Read more articles about the luxury watch industry by following our luxury blog.